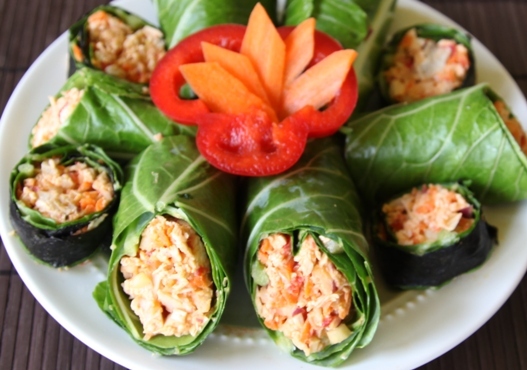 Delicious chicken salad stuffed into collard greens, nori sushi sheets, tortillas, or serve on a bed of lettuce on a plate for lunch or turn into a quick and easy dinner by serving it with soup or a salad. Stuff this delicious chicken salad into collard greens or a sprouted-grain or wheat tortilla for a yummy chicken salad wrap. Don't want to wrap it...no problem, simply put it on a bed of lettuce on a plate and enjoy. Try using pre-cooked rotisserie chicken to shorten preparation time. In a small skillet, over medium heat, add 1T of oil. Add the chicken breast to the pan and cook about 5 minutes on each side. Add the wine to the pan, turn chicken breast over, cover, and simmer about 5 minutes. Turn chicken over, simmer about 5 more minutes or until cooked. Remove chicken from heat and cool. In the meantime, wash the carrots, celery, red bell pepper, and onion. Peel and grate the carrots and add to a medium size mixing bowl. Chop the celery into very small pieces and add to the bowl. In a food processor or by hand, mince the bell pepper and onion and add to the bowl. Cut the cooled chicken into very small pieces. Add to the bowl along with the mayonnaise, salt, and pepper. Mix well. You can chill the chicken salad before serving but you don't have to. Wash the collard greens if using, and remove the tough, narrow ends. On a plate, lay two collard greens with the stem end facing in opposite directions. Add 1/4 of the chicken salad mixture towards one end of the collard greens lengthwise and roll up. NOTE: you can add lettuce, tomato slices, and sliced cucumbers before rolling up the wrap. Secure with toothpicks on each end and slice the wrap in half. Repeat with remaining chicken salad for a total of 4 wraps. If using tortillas, lay a tortilla on a plate, put 1/4 of the the chicken salad mixture towards one end of the tortilla lengthwise and roll up. NOTE: you can add lettuce or spinach, tomato slices, and sliced cucumbers before rolling up the wrap. Slice the tortilla in half. Repeat with remaining chicken salad for a total of 4 chicken salad wraps. 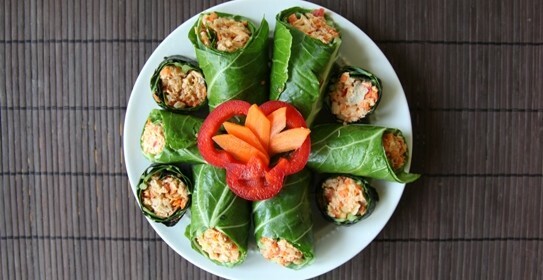 Put the collard greens on a nori sushi sheet before rolling, then slice the wraps into small sections or rounds. Make sure to trim the edge of the collard greens so the nori sheet sticks to itself along the folded edge. Slice the tortillas into small sections or rounds. Put the chicken salad on a bed of lettuce on a plate instead of using it in a wrap. WHY PAY MORE FOR ORGANIC CHICKEN?